Robert C. Pozen taught a full course load at Harvard Business School while serving as the full-time chairman of a global financial services firm. He’s written six books and hundreds of articles, raised a family with his wife of almost four decades, and served on many boards of local charities and public companies. Pozen is a prince of productivity, a man who has worked smarter and faster than almost everyone around him for more than 40 years. 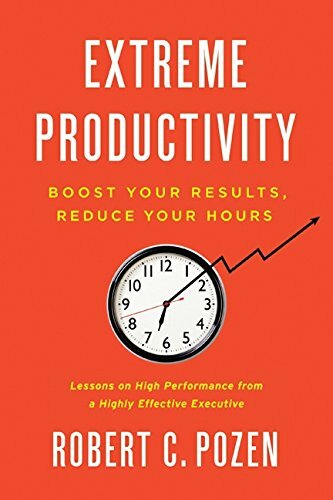 In Extreme Productivity, Pozen reveals the secrets to workplace productivity and high performance. His book is for anyone feeling overwhelmed by an existing workload — facing myriad competing demands and multiple time-sensitive projects. Offering antidotes to a calendar full of boring meetings and a backlog of emails, Extreme Productivity explains how to determine your highest priorities and match them with how you actually spend your time. Pozen shows that in order to be truly productive, professionals must make a critical shift in their mindset: from hours worked to results produced. He helps people at all stages of their careers read, write, and make presentations quicker and more effectively. He provides professionals with practical tips on how to efficiently use their time in the office while leading full and productive personal lives as well. • How to set and prioritize your goals. • How to improve your productivity in your daily routine. • How to manage your subordinates and your boss. • How to embrace change and use it to chart a satisfying career. Success comes not just from hard work and careful planning –– though those are both important. Success depends in large part on proper mindset: focusing on the results you plan to achieve, rather than the number of hours you work. The results are what matter most to your employer, clients and colleagues. 1. Write everything down. On one or two sheets of paper, write down everything you are required to do in your professional life. This includes all those routine tasks in your job description. It also includes any long- term projects. 2. Organize by time horizon. Divide your list into three time categories: Career Aims (5+ years), Objectives (3–24 months) and Targets (one week or less). Make sure that each of your Objectives has one or two associated Targets. 3. Rank your Objectives. Start by thinking about what you want to do, what you’re good at, and what the world needs from you. You should also consider what your boss wants and needs. Rank your own list of Objectives on a scale of 1 to 10, with 10 being the highest. 4. Rank your Targets. Your Targets will typically fall into two categories: Enabling Targets help you accomplish your Objectives, and Assigned Targets are given to you. List your Enabling Targets and rank them based on the importance of the Objective in question and how effectively the Enabling Target furthers that particular Objective. In many cases, you should consider Assigned Targets low priority and spend as little time on them as possible. 5. Estimate how you actually spend your time. Take out your calendar and answer these questions: How many hours do you spend at work? What are the three main activities on which you spend the most time? How many hours do you spend on company meetings, filling out forms or reports, or responding to emails? Now go back and compare your allocations of time with your ranked list of Objectives and Targets. 6. Address the mismatch between priorities and time spent. If you’re like most professionals, you will find that you are spending no more than half of your time on your highest priorities. Some professionals have not carefully thought about their Objectives and Targets. They often neglect an important goal — until it becomes a crisis, demanding their full time and effort. At higher levels in an organization, an executive’s ego often causes him or her to spend too much time on certain activities. This discrepancy between top priorities and time allocation can occur at all levels of an organization. Some solutions will require changes in your personal habits. Other solutions will require changes in your organization’s procedures — or the way you deal with them. Your Daily Routine. How can you make sure that you are accomplishing your highest goals every day? The key is to create a daily calendar that drives home your most critical Targets. First, your calendar must record all of your daily commitments in one place in a way that you can easily see the purpose of each appointment and the importance of each assigned task. Second, the calendar must be mobile: you must be able to carry — or have electronic access to — your calendar during the whole day so you can easily add new items or revise your existing schedule. Gaps are crucial to the successful schedule; they give you time to make calls, write notes or even think! Many executives line up meetings and conference calls for every hour of the day. That is a big mistake — you need time to digest what has happened and develop strategies for the future. Next to a meeting or phone call, I write down my purpose for the event — what I want to get out of it. This ensures that I’m focused on the purpose of each meeting or call while I am engaged in them. A very important part of my daily routine involves getting enough sleep and exercise, both of which are easy to brush aside when work gets busy. But skimping on either of these key activities will seriously harm your productivity. If you want to be an effective reader, you have to know your purpose for reading and stick to it.List all the news sources, virtual and physical, that you read regularly for reasons other than amusement. Ask yourself how you’re reading each source: Are you concentrating on your goal for that publication, or does your attention wander every time you see an entertaining headline? Next to each publication, jot down an estimate of how much time you spend each week reading it. Does your allocation of time make sense, given your professional Objectives? If not, read only those sections that are relevant to your purpose or stop reading that publication altogether. 1. Grasp the structure of the reading. Before you start to read a document, take a few moments to understand its structure — how it begins and ends, and how it divides the major topics in between. In books, look at the table of contents. In shorter works, glance at the headings. This will help you both read faster and understand more, because you already know how the author plans to move from one idea to the next. 2. Read the introduction and conclusion. First, read the introduction carefully, looking for the theme sentence or paragraph that will unlock the whole article or chapter. Then skip directly to the conclusion. Why? Because the conclusion tells you where the writer is going to end up. Only when you know where the writer is aiming should you read the body of the text. 3. Skim the tops of the paragraphs. Unfortunately, skimming has gotten a bad rap in the academic community. But I’m not talking about that kind of passive skimming. To actively skim the body of an article or chapter, you should read the top of each paragraph. A good writer starts each paragraph with a topic sentence, followed by supporting facts or arguments. As you read an article or memo, constantly ask yourself what you want to remember from it. Think about your purpose for reading before and during your review of the material. Think about what you want to remember during and after you review the material. Writing is an essential skill for knowledge-based workers. They must compose documents to inform, lead, and persuade others both inside and outside their organization. Poor writing undermines professional productivity in many ways, frustrating customers, baffling employees, and creating office tension due to miscommunication. Think of writing as having several distinct phases, including an initial phase of mapping the terrain and the second phase of translating that map into actual prose. Formulate a rough plan for the entire piece before you put pencil to paper. If you try to write without a plan, you will face an enormous challenge. My approach to creating an outline is completely systematic: first I brainstorm, next I categorize, and then I outline the final product. The three key elements of any essay are the introduction, the conclusion and the body. In my view, a good introduction must fulfill three objectives: provide the reader with context, state the main theme of the author and explain the organization of the writing. Create an executive summary for long or dense documents that describes the big picture so that readers short on time can understand the main points. Don’t use your conclusion to merely summarize the piece; provide the reader with additional insight, such as broader implications or suggestions for future actions. Use effective language. This means short sentences, clear relationships between clauses and proper use of antecedents for pronouns. Proofread your paper for grammar and spelling mistakes. When you’ve finished, proofread again. Don’t try to write and revise at the same time or you’ll get hung up on every sentence. Don’t try to write a long piece in one sitting; write every day for an hour or two in an environment that best suits you. Managers can get the most out of their employees by helping them achieve meaningful progress every day. Sadly, most managers don’t seem to be aware of this. To be an effective boss, you have to set up a system that enables both you and your employees to get meaningful work done. The heart of that system is delegation. If you’re following my advice so far, you’re spending most of your time on Objectives and Targets that rank highest for you and your organization. But your lower- ranking goals still need to get done. Here is where delegation comes into play: it allows you to focus on your top priorities while other people complete or assist with your lower-ranking goals. So what’s the key to effective delegation? You and your lieutenants need to embrace the principle of “Owning Your Own Space.” After setting clear goals for a project, give your employees broad discretion to decide how best to achieve these goals — and then get out of their way. If you allow your workers to own their own spaces, they can adapt quickly to changing conditions rather than waiting for your approval. When you give your workers broad discretion to carry out projects, they feel responsible for the outcome and become much more invested in its success. • Ask candidates to talk about their personal history, starting with where they went to high school. • Ask candidates how they made the biggest contribution in their prior jobs. • Engage candidates in intellectual debate about a subject of their choosing that they know well. • Choose the candidate with the most potential, not the person with the most experience in the industry. • Make the reference calls yourself and press hard for honest evaluations, rather than the usual platitudes. After recruitment, carefully build trust between you and your employees. Have integrity, be courteous, and communicate openly and frankly. Provide employees with support and resources to complete tasks that they have been assigned. Be their advocate elsewhere in the organization. At the start of a delegated project, agree with your team on objective and subjective metrics for each project goal. Choosing the right metrics will often force you to have a deeper discussion with your team about what you really consider important. Make sure that you carefully design each metric to accurately capture the project’s goals. During the course of the project, discuss its status with your team and revise the project’s goals and metrics if needed. But let your employees decide how to implement those revised goals and metrics. Tolerate and celebrate well-intentioned mistakes, but don’t condone repeated errors or ethical lapses. If you need to criticize your employees, do so in private. Address their specific behaviors; don’t attack their personalities. Be effusive with praise of your subordinates. It’s very hard to give them too much positive feedback. You don’t control the trajectory of your career. There are just too many factors beyond your control that will shape your job opportunities — such as global economic trends, political elections, industry regulation and company finances. 1. Your Supply: Think about your own interests and the skills that you can offer to employers. What topics do you find most enjoyable and interesting? Are you more adept at reading and writing or playing around with numbers? Consider not only your formal credentials but also your intangible personal skills, such as the ability to think on your feet or empathize with the less fortunate. To get a good understanding of the skills and interests that you need for particular jobs, talk to people already in these jobs. 2. The World’s Demand: Evaluate whether there is sufficient market demand for your desired career. Even if there are some jobs for your desired profession, there may be too much supply relative to the demand. Don’t just look at market demand by taking a snapshot in time; find out where the industry is going. Is it expanding or contracting? After creating some tentative Career Aims, ask yourself how you can move your career in the right direction. You should pursue a combination of formal classroom education and informal learning on the job. Seek knowledge and skills — such as leadership skills, experiences in foreign countries, and stints at different types of organizations — that would be transferable to many types of jobs in the future. Professionals at all levels should focus on results produced rather than hours worked. It’s the best way, in my opinion, for you to get more done at work while enjoying more time with your friends and family. However, I’ve also been impressed by how much your approach to productivity should depend on your own specific situation. You should carefully consider your own stage in life and your organization’s culture as you apply the lessons offered here. Remember that you have control over your own mindset and behaviors on productivity. Write down your goals, divided into time periods and ranked in order of priority. Then you’ll be in a good position to spend the most time on your highest goals and minimize the time you devote to less significant matters. Regardless of your employer’s culture, you can adopt most of the specific techniques in this book. Ultimately, it is within your power to boost your results and reduce your working hours.